An early development in Indian Buddhist iconography was the 'Crowned Buddha.' In these images the Buddha is not shown wearing the monk's robe and the close-cropped hair of a mendicant, but the diadem-crown and jewelled ornaments of a king. This iconographic type were extremely popular in the Bodhgaya region during the Pala period, and from there this unique aesthetic ideal later migrated to Tibet and Nepal. The Crowned Buddha symbolizes the Beatific Body (Sambhogakaya) form of Buddha. Among the Three Bodies of the Buddha, the Emanation Body (Nirmanakaya), the Beatific Body (Sambhogakaya), and the Truth Body (Dharmakaya), this represents the manifestation of the Buddha visible to those of greatly purified mind, such as tenth-stage Bodhisattvas. This form was made especially important in Tibet from the first Great Prayer Festival in 1409. 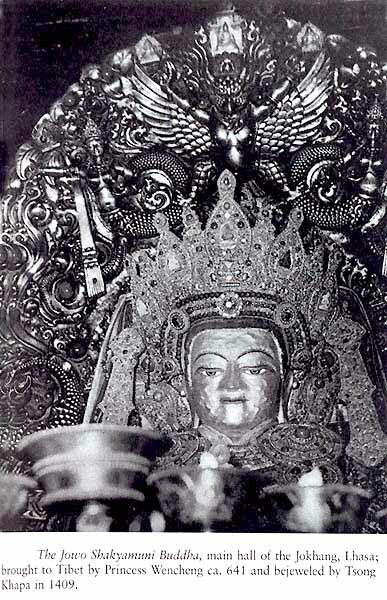 During that celebration, Tsong Khapa transformed the Jokhang temple's Shakyamuni statue - an image venerated since its presentation to Tibet by the Chinese bride of the great Tibetan king Songtsen Gambo in ca. 640 - by crowning and bejewelling it to represent the Beatific Body form (see accompanying image). Thus began the identification of the Crowned Buddha with his Beatific form. In this present sculpture, Buddha wears a five-tiara crown, which symbolize the five transcendent Buddhas. The skill of the sculpting hands can be felt in the complex draping and fall of the robes. The upper garment covers both his shoulders and he wears regal and luxuriant jewelry which includes bracelets; armlets, necklaces and a pair of elaborate earrings. A choker (collar) further adorns his neck and carved on it is the kirtimukha, which is a symbol of auspiciousness. The radiant face of the Buddha is slightly smiling, and the soft, thin, almost feminine lips lightly pursed together.